Hello my fellow truth seekers. 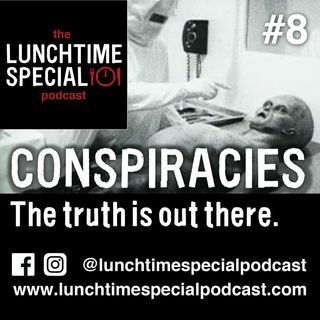 In this episode the Lunchtime Special crew discuss, debunk and debate all things conspiratorial. We touch on flat earth, reptilian overlords, Scientology, Area 51 and the insane conspiracy that the country of Australia does not exist. The powers that be clearly didn't want us to record this show as we were plagued with technical issues, but we persevered and delivered. Also a general warning, we didn't hold back our thoughts regarding the sanity of ... See More conspiracy nuts out there, flat-earthers we're looking at you. So grab your tin-foil hats, sit back and enjoy the show.